Nothing lights up a room quite like fresh orange flowers! Ideal for spring and summer to bring that outdoor feeling indoors and lighten the atmosphere in any room of your home or office. 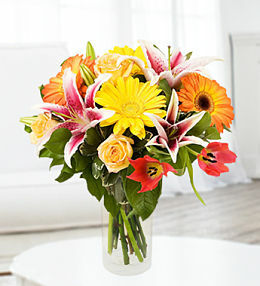 In the work place, orange flowers will surely catch the customerâ€™s eye and make them feel welcome and right at home. In your home, you can decorate your living room, kitchen or any other room with bright orange blossoms and they are sure to stand out. Whether you prefer Gerberas, Freesias or other orange flowers, you will find something to suit your taste right here. Our professional florists at Prestige Flowers know just how to pair up orange beauties with flowers of other colours and textures to create the most elegant and bold bouquet just for you. 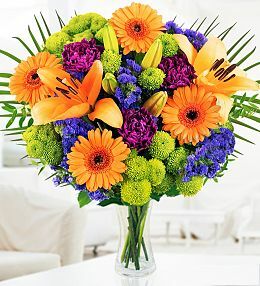 Send orange flowers to celebrate the arrival of a new baby, somebodyâ€™s birthday or even as a get well soon gift. The traditional colour for oneâ€™s 21st wedding anniversary is orange so, if you are celebrating your anniversary or know a couple who has enjoyed 21 years of marriage, orange flowers would make a meaningful and special gift. If, like many of us, your days have been so busy that time has run away with you and you need somewhat of a last minute gift idea, then our luxurious orange bouquets will help you right out of that bind youâ€™re in! Thanks to our option for next day flower delivery, your flower order can be delivered faster than you thought! This beautiful bouquet of orange gerberas is complimented by blue statis and fresh purple carnations, framed amongst a bed of fresh lush foliage. 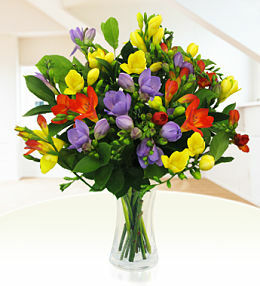 Orange flowers and blooms for delivery accross the UK via our network of couriers. Beautiful orange flowers perfect for any occasion.